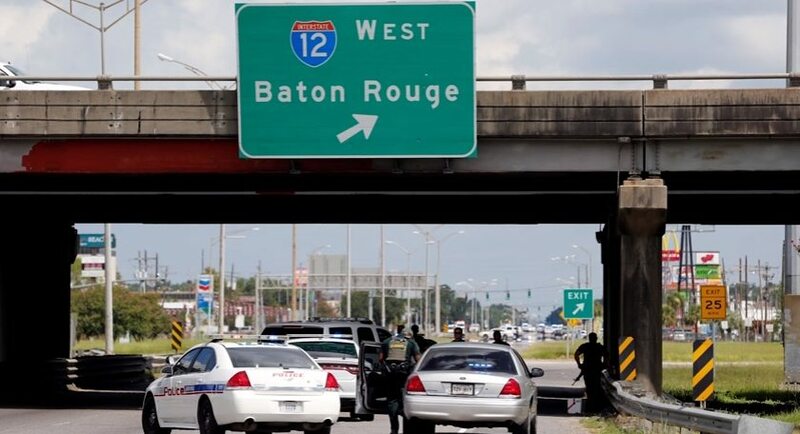 Baton Rouge police officers were ambushed and shot to death by a deranged man on Sunday after responding to a call about a man walking down Airline Highway with a rifle. Caught in the crossfire were women in a vehicle near the scene who caught the situation on video with audio. “Look, we’ve got a guy right behind us,” says another woman, shortly before gunshots are heard right by their location. The gunman has been identified as Gavin Eugene Long, a former U.S. Marine, has been identified as the gunman who opened fire on police in Baton Rouge, Louisiana, MSNBC has reported. Long, described as a black male from Kansas City, Missouri, was killed at the scene of the shooting, CBS News reported. Just last week, Baton Rouge, Louisiana police uncovered credible threats to harm Baton Rouge police after pawn shop burglary and arrests when Baton Rouge Police Chief Carl Dabadie said last Tuesday that officers uncovered a “credible threat” against police from one of four burglars who broke into a Government Street pawn shop and stole eight handguns, the Advocate reported.